Pakistan Tehreek E Insaaf Member of Provincial Assembly Sindh, Syed Imran Ali Shah, Son of the late Muhammad Ali Shah one of Pakistan’s most revered Orthopedic surgeons and member of the Pakistan Cricket Board governing board. He was the Provincial Sports Minister of Sindh. He was also the Chief de Mission for Pakistani athletes in the Commonwealth Games 2010. He devoted 10 per cent of the AO Clinic’s revenues to supporting cricket in Pakistan, and in 1993 created Asghar Ali Shah Cricket Stadium in North Nazimabad, Karachi. The stadium hosts the Dr Mohammad Ali Shah Night Twenty20 Cricket Tournament every year in the month of Ramadan. Although with regards to conduct, the senior Shah was also not too far off from his offspring. 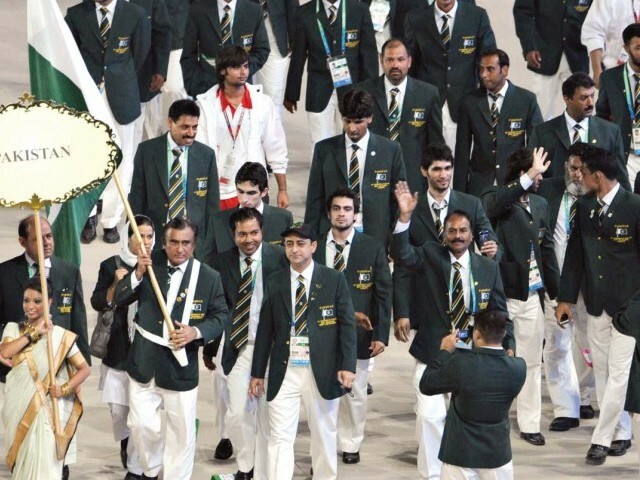 Pakistan athletes led by chef de mission Mohammad Ali Shah, who insisted on carrying the flag to lead the team parade instead of celebrated former gold medal weightlifter Shujauddin Malik (second from right), arrive onto the field at the Commonwealth Games opening ceremony at the Jawaharlal Nehru Stadium in New Delhi on October 3, 2010. The Pakistan Olympic Association (POA) had decided over a month ago that Shujauddin Malik, the country’s gold medal winning weightlifter at the 2006 Commonwealth Games, would lead the Pakistan contingent during the ceremony. It was an honour well deserved for a man who not only won gold but also scripted his name in the record books for his 2006 effort. But as the ceremony started yesterday and teams strode into the Jawaharlal Nehru Stadium one by one, the Pakistani contingent despite receiving the most rousing reception out of all the participating nations, experienced a moment of great embarrassment. It wasn’t Malik who was seen carrying the flag and leading out the contingent but instead, it was Dr Shah – despite TV screens around the world displaying the name ‘Shujauddin Malik’. Fine, one thought. ‘maybe Malik wasn’t feeling up to it.’ But only moments later when people saw Dr Shah pushing aside Malik as cameras rolled, it was clear what the actual deal was. My blood boils seeing the brutal abuse of power by the son of the same man whose only claim to fame seems to be his father’s questionable and controversial “good name”. Imran Ali Shah made national news, when he physically assaulted a citizen near National Stadium, Karachi. A video of Shah assaulting a citizen quickly went viral and sparked outrage. Following the incident, PTI issued a showcase notice to Shah after his reprehensible actions. Imran Ali Shah made a ludicrous video in an attempt to clear the air with regards to the happenings surrounding the one sided beat down of a helpless and defenseless old man. The video completely fell short of giving any semblance of credibility to Imran’s side of the story, many bystanders of which there were plenty commented on the poor rebuttal from the doctor and tried telling what actually transpired that fateful day, getting the powerful politician flanked by armed security guards all worked up and angry. he just said “TM MPA MNA HO TOW KEA AB TM BHI BADMASHI KROGY) and Imran Shah replied HAN MEH BADMASH HUN TERI MAA KI CHOOT” and started beating the uncle who seemed elder than Imran Shah. The son of the elderly man on the receiving end of the Huffing Puffing tough-guy doctor’s slaps and wrath also had something to say after pictures circulated on PTI’s official media portals of the Doctor and the elderly man “hugging it out” and calling an end to the much talked about incident. Dr. Imran Apologized and Naya Pakistan’s sanctity was restored, read the post below. The elderly man who was man-handled by the brave doctor in apparently and act of self defense after the old chap unleashed a barrage of piercing abuses towards the good doctor making him loose control of his mental faculties and making him thrash the guy repeatedly before getting back into his lavish 4 by 4 and driving off into the sunset like the brave gladiator that he is. It turns out that the old man in the video getting slapped is no ordinary man, rather a very high ranking government official with strong political connections. The man is said to be friends with few of the biggest people in PTI’s creme de la creme especially with regards to Karachi and still he was defenseless and powerless in front of the Dr. who was clearly intoxicated with a newfound sense of power and authority. Just imagine if their was no high ranking government official with good political connections getting thrashed, What if, it was an extremely poor individual with absolutely no means, a helpless individual of the society whose biggest worry in the day is to get atleast enough food in his belly to survive. Is this the vision for Naya Pakistan? If this is it, then I want no part of it, There is no way out of this, the MPA must be sacked and humiliated, Period!